If a dining room table could talk, what tales would it tell? Tales of triumph, disappointments, fears, dreams, happiness, sorrow? The table above belonged to my mom's grandmother. It was a wedding gift to her mother upon her marriage to my great grandfather. 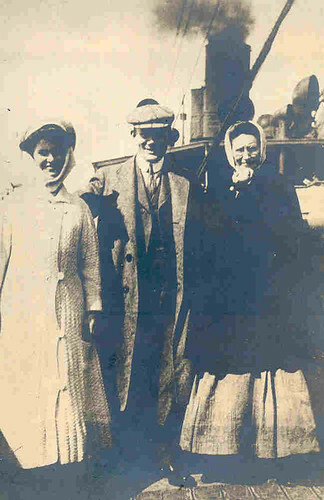 Bertha (my great-grandmother, and her real name) met my great-grandfather Ernest on the steam ship coming from Europe to the United States in 1911. This is the picture they had taken en route. Bertha is in the white coat on the left, her chaperon, Miss Brehren, is on the right. Bertha, was leaving her home and family in Switzerland to be a governess for a wealthy Chicago family. Ernest was leaving his home and family in Germany to work as a baker at a Chicago Hotel. His older brother had already established himself as a Grocer in Defiance, Ohio. Ernest was coming to make his way in the world. I remember my grandmother telling a story that Bertha worked with her sister in their family's shop. They were seamstresses/tailors. Her younger sister had been spotted through the window by an handsome young man who entered the store, professed his love for her on the spot and they eventually married. Bertha on the other had, had no suitors. In fact she was in her 20s - - I'm recalling she was around 24 or so when she left for the United States, an old maid by the standards of the day. Back to the dining room table and why I am blogging about it. It was a wedding gift to Bertha. It was a wedding gift to my sister. Our grandmother died the summer before my sister was married. When the estate was finally settled, all of the furniture was auctioned as a way to keep my mother and her brothers from fighting over everything. If they wanted it, they could buy it all the money would then be split among all six of them. My future brother-in-law won the bidding war with one of my uncles and gave it to my sister as a wedding gift. Why did my brother-in-law buy this table for her (it also came with the buffet and china cabinet)? Because she had told him the special place this table had in her heart. You see, we grew-up living next door to our grandparents, which was a wonderful thing. My grandmother was the only child so they acquired all of her parent's belongings when they passed away. You could see into my grandparents' home from our kitchen window. Every night, they had dinner at the table. Grandpa at the head, grandma next to him. The table was huge - - apparently, they always had it extended to its full capacity. It was only when my sister set it up in her home did I see it at its normal size. But any way, there was always comfort seeing my grandparents eating their dinner at that table in the warm glow of the chandliers. My sisters and I and on occasion, our friends often feasted on ice cream at that table. My grandparents had a cavernous freezer in the basement that was always stocked with ice cream and popsicles. They always had a slab of real butter in the butter dish, which my sisters and I would slather thickly on Ritz crackers. Under the table, it was a magical world. My sister K and I would cut apart old Sears or JcPenney catalogs to make paper dolls and we'd play for hours under the table. Other times, the table served as a space ship or a covered wagon - - it was whatever our imaginations imagined it to be. 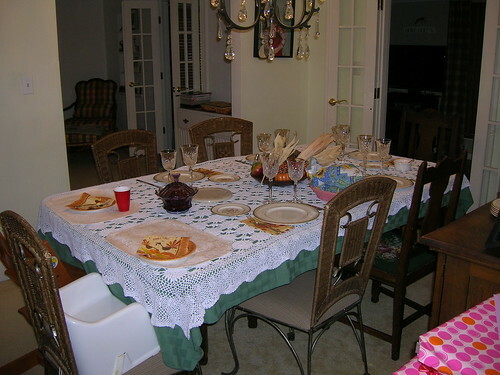 We celebrated birthdays, my aunts and uncles' visits, Easter and Christmas Eve around the table. Christmas Eve was magical at my grandparents. All the antique ornaments on the tree and the goodies that lined the table on these beautiful serving trays. I was curious what the traditional German name was for the Christmas Eve feast - - my Polish family called Christmas Eve, Wigilia (the W is pronounced like a V), my Italian friends called the feast the Jospeph's Table. Just discovered, like two minutes ago, that the German Christmas Eve feast is called Dickbauch - - or fat stomach. Hmm, now I know why my family just called it "Christmas Eve" - - for some reason, I'm thinking we'd have slaughtered the German and called it something like "Dickballs" as children. Yes, I digress and I'm getting silly because I was getting to sentimental and it was making me get all weepy - - so I had to lighten it up a little. But anyway - - I'm thinking now, why does German sound so ugly? I mean Christmas Eve is Froehliche Weihnacten - - which I'm sure my sisters and I would have, at four years old be calling it Fro lick weiner bottom - - or something like that. Wigilia is so much prettier. O.k. back to the dining room table. What made me think about a piece of furniture that doesn't even sit in my house? I read a blog today from A Soldier's Mother, called simply, The Table. Her son is in the Israeli Army and as you know, this past week, Israel has executed a series of air strikes against Hezbollah and Palestinian militant positions in the Gaza strip. They have called up all Reservists, military analysts with the news outlets think this is preparation for a ground attack into Gaza to route out the Palestinian fighters. Soldier's Mother writes about how the seating arrangements and size of the table changed as their family grew and how this year, her son could not be with them to celebrate the final night of Hanukkah. It just made me think and reflect. What universal experiences we all have around the dining room table, no matter what country we live in. The visible emptiness that is left at the family table when one of the members can not be there, yet despite the empty space, new memories are being formed by those who are present. Not all memories from around the table are happy memories. The table that now sits in my sister's home shared bits of sorrow with my great-grandparents when they learned of Ernest's brother's death in World War I. It shared hard times and fear during the great depression and then World War 2. It was were decisions were made regarding Ernest's care when he began suffering from dementia. It was were wedding announcements, births and baptisms were shared. It is where my family gathered after my grandfather's death. Where we all gathered again after my grandmother's death. I'll never forget looking through the kitchen window into the dark dining room and empty table, knowing I would never again see my grandparents sharing their day with each other as they shared a meal together in the warm glow of the chandelier. What a lovely, lovely post. It made my Monday morning a little brighter! That looks great! Spacify offers wide range of dining room tables.